Last summer I visited L’Arche (The Ark) in Trosly-Breuil, France—the birthplace of a community that brings together adults with intellectual disabilities and young adult volunteers known as assistants. The model, conceived by humanist, philosopher and theologian Jean Vanier, now operates in 40 countries. In a phone interview on Monday I asked Jean what he’s learned living with people with intellectual disabilities. I was struck by the beauty of how Jean speaks and listens. BLOOM: Is intellectual disability the most stigmatized of disabilities? Jean Vanier: I think it can be considered one of the most stigmatized because it touches something very profound. Many people define human beings because of their capacities and success and so on. Aristotle would define someone as a ‘reasonable’ person, a person who can think, a person who is capable of doing things. He would talk about the intellectual component. And of course people with intellectual disabilities are wounded in their intellectual component, but they have another component which is very much alive, which is their capacity to love. Somewhere in their deepest personhood they are rejected. This is the story of people with intellectual disability over the whole of history. They were considered as a punishment from God. We see this even in the Gospel of John, when the disciples of Jesus see a man born blind, one asks: ‘Is it because of the sins of the parents or his sins?’ For someone to be born without seemingly a capacity to be fully human is seen as something horrible, and therefore these people are hidden away. People don’t realize that the secret of being human is the capacity to understand, but more than that, it is the capacity to love. To be human is to bring the head and the heart together. Individuals with severe intellectual disability have the extraordinary capacity to enter into relationships, to trust, and to love, and that is maybe the great secret of the human being. It is love that will unify the human family. We need to learn to love each other, not just to have a good head where we’re proving that we’re better than others. BLOOM: How has your thinking about life changed as a result of living with people with intellectual disabilities? Jean Vanier: I think what I’ve discovered living with them is about the primacy of relationships. The important thing is to be in communion with people and from communion rises up joy and fiesta. We human beings are made to have fun, we’re made to be happy, we’re made to be people of joy and joy flows from communion and unity. Anguish and violence comes from all the forms of disunity. So human beings are called to become one and to be together. People with disabilities call forth what is most beautiful in me and others, which is the capacity for tenderness, but they also call forth difficulties, to see my own difficulties in relating and call me to work on them. 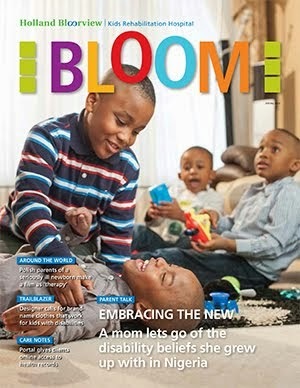 BLOOM: I often feel that my son’s disabilities are shining a light on all of my weaknesses. Jean Vanier: That I really understand—showing a light on our weaknesses, showing a light on what it means to be human. The danger in our society is to pretend that we’re strong and powerful. We can do things, but we are all human beings. We were born in weakness and we will die in weakness. We were born to grow strong but also to grow weak. Discovering our weaknesses is about discovering who we are. The fundamental thing for human beings is to accept ourselves as we are, with our strengths and also with our weaknesses. And weakness is not something bad. It implies: ‘I need your help.’ That brings us together, because I’m not able to do everything myself. I’m calling out: ‘Can you help me?’ Fundamentally, we human beings, what we need most deeply is to know that we are loved and accepted. BLOOM: We live in a fix-it culture where no one is ever good enough as they are. I think for parents of children with intellectual disability, there’s a real conflict between accepting your child and trying to change your child so that your child will fit into the world better. Jean Vanier: That is a tension even for us here in L’Arche. The great fear of parents is that they don’t want their child to be looked down upon and rejected, so they want them to be as capable as possible and accepted. All of us have to go through this tension between showing we are capable and accepting ourselves with our weaknesses. BLOOM: My son is 19 now, and sometimes I’m tired of the pressure to always be working on things with him. I feel that I miss out on enjoying the moment. Jean Vanier: What I hear also, and I find it beautiful, is taking the time to enjoy the moment, to be together, to have fun together, so that he discovers that you love him—not because he can change and be better, but just as he is. To rejoice, to be together, each one of us as we are, that is fundamentally important. BLOOM: It’s often assumed that people with intellectual disability can’t have a good quality of life, particularly in the medical world. Jean Vanier: I think richness of life comes from richness of relationship. If we view richness of life from the point of view of success—power, a beautiful marriage, two cars and a house, having two children—the reality of human beings is not that. You can have all the riches of the world and still be terribly upset because no one really loves you and accepts you in your fragility. When I think of the richness of life I think of someone like Antonio, who was here with us. He had an incredibly beautiful face and eyes and smile. He couldn’t walk, he was as fragile as you could imagine, but he had a capacity to trust us and to enter into that relationship to be with him. He changed people’s hearts. He brought us to the place of rejoicing that we are human beings together. So if the richness of life is viewed only from society’s view of success and power, then people with intellectual disabilities do not have that. But in reality, if we accept them as they are and if they accept us as we are, we can enter into this beautiful relationship which is a relationship of celebration. There is a beautiful story of a young man in the Special Olympics who wanted to win the 100-metre race. He got into the finals and he wanted to be first. The guy running in the next lane tripped and fell and he stopped, picked him up, and they ran hand in hand, and finished last. He was accepting not to have the prize, but to live community and solidarity. BLOOM: The neurodiversity movement has been looking at advantages of different types of brain wiring. Do you think there are positives that come from the way people with intellectual disability think and see the world? Jean Vanier: I think we have to be careful. People with disabilities are so different from one another. What is absolutely certain is that their fundamental need is to be loved, and to enter into relationships. The danger of many human beings is that we’re caught up in the idea of success, of power, of doing more and more and having more. We do have to help people with disabilities to progress—to be better in the world of communication, to be able to do things to become more autonomous. But what is the most important is this incredible capacity for friendship and love, and the way they can throw themselves into our arms and be as they are, simple and loving. People like your son can be caught up in this fear of not being accepted by society, and at the same time being very sensitive to love. I’m sometimes touched by the suffering of people with disabilities who are caught up in the same dilemma or tension as many mothers: wanting to be better, wanting to do things and be acclaimed, but at the same time accepting to live in the moment of tenderness and love and celebration and dancing. BLOOM: Do you think our culture will ever change to the point that people with disabilities are accepted? Jean Vanier: I think there will always be a tension. I think something has to be done in schools. I think if one can teach right at the beginning of school, not just the need for success and to go up the ladder, but the need for being together. I was at a school in Calcutta where they were in a circle and the ones who were better were helping the ones who were doing less well. It’s to help children to discover the power of love. That togetherness is something incredibly beautiful. The fear is that our schools are being run on the power system and children are not learning to be together in a place of happiness and love. This is the problem of deep individualism. There’s a whole change needed and let’s begin at the school level, to help children so that they no longer despise a child in the classroom who’s weaker, but they can see that it’s a benefit to everybody and it brings forth the beautiful qualities in children. BLOOM: I was amazed when I visited L’Arche in Trosly-Breuil last summer to speak with an assistant who’d been living there for 36 years. Jean Vanier: People discover a new way of being. They discover how their qualities of love have grown, and how they’ve grown, and how fundamentally they’re deeply happy here. We have fun together. It is good to be together and there are many people here, in this particular community, who have been here a very long time. Amazingly, there are a number of young couples aged 28 to 40 who are asking to come to L’Arche as assistants because they have experienced all of the conflict and difficulties for a family in the ordinary life of society. These are young couples who are leaving society, where there’s all this tension to go up the ladder, all this stress, to live here in community and to raise their families here. BLOOM: What advice would you give parents of children with disabilities? Jean Vanier: My idea would not be to give too much advice but to be with them and to listen to them and to hear first their pain, and to gradually help them discover that their child has values that they have not yet seen in him. I would encourage them to come to a L’Arche home and to see the fun and happiness that people have. But as I say, I’m wary of giving advice. I like to be with people and I really understand parents who in some ways feel crushed and hurt, because they were hoping so much for a child that would grow up and have children, and the parents would be grandparents. So, first of all, I would understand the pain of people. There is pain. But then to walk with them and help them and to discover that their child is really very beautiful. It can take some time for parents to come to that place of rejoicing. BLOOM: Do you find that parents’ perceptions of their children change after they come to live at L’Arche? Jean Vanier: When a child comes here there’s a joy and a pain. Pain because their child is no longer living with them, but a joy because they know that when they, the parents, die, their children will be well. There’s always a tension with parents, and the more disabled the child is, the more the parents have grown to love him, to hold on to him, to nurse him, to care for him or her and then the idea of losing control over the child or losing that relationship is sometimes very painful. But parents are there not to hold on to children, but to help them be well and to grow according to their own gifts. BLOOM: As a parent I’m fearful when I hear of stories of abuse that takes place, not at L’Arche, but at other homes for adults with disabilities. 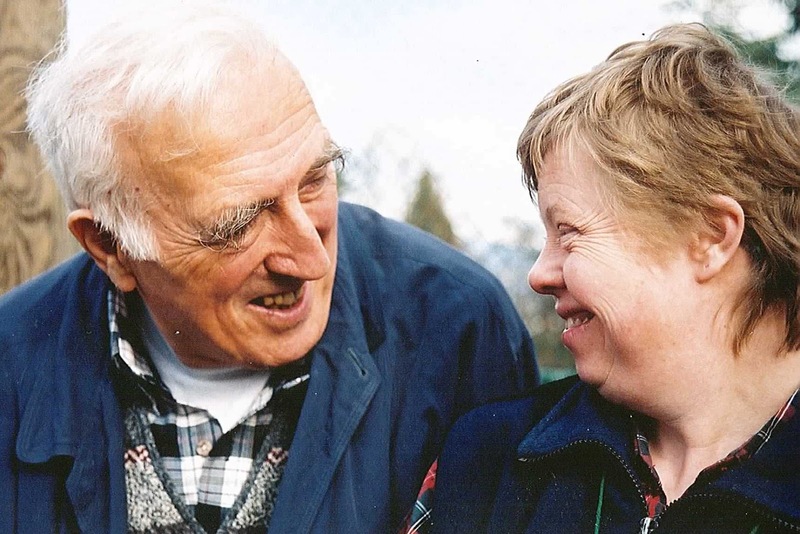 Jean Vanier: L’Arche began when I took two men out of an institution which I considered violent and not good and not really attentive to the needs of people. There is, let’s face it, the whole history of humanity has been a long history of abuse and violence towards people with disabilities. People don’t want to have people with disabilities around because it reminds them of their own disabilities and capacity to die. There will always be a struggle and parents have to realize that and we have to work together, not just for people with disabilities, but for people with old age, with Alzheimer’s, with other illnesses. This is a bigger challenge than just people with disabilities. We have to discover that to be a human society we have to be intensely present to those who are weak and in need. A society can only be human when the strong and weak come together to celebrate life. BLOOM: It’s funny that we’re all mortal and yet so often we go through life pretending we’re invulnerable. Jean Vanier: We praise the strong, we praise those who are winners, and we tend to despise the weak, or we feel despised if we are weak. The greatest pain for human beings is humiliation, to be despised and put down. The greatest fear of people who are strong is that one day they will be humiliated and won’t succeed as they wanted to succeed. We need to understand that our treasure is not in our power, but in the deep acceptance of who we are, and who we are is different but we are all people. If we try to be who we are not, that tension will someday explode. I can never read too much of his words and thoughts. Thank you for this, Louise, and thank you Mr. Vanier -- you are balm to the sore soul. Indeed. Everything that Elizabeth said and more. Thank you for sharing this beautiful interview, Louise. Just lovely. Wise words. Thank you. I must say, there are communities out there that can be found with the use of invaluable resources like help directory, they help us people to connect with organizations near our area. Such wonderful truth spoken in Jean's words.